No matter how much we love green energy, we're still highly dependent on fossil fuels for our massive energy needs. The problem, per se, is not that we cannot produce clean energy. Oh no! We can produce infinite amounts through hydro, soar and wind. The real issue is storing this green energy. That's where oil comes into the picture. We love this black gold so much because it is what we need most: stored energy. Extract it, refine it and store it forever. And since it's a scarce and finite resource it renders itself to financial speculation - and we, as a species, are highly motivated by gain. (The Reward Bias, also called the Incentive Bias, is one of the most compelling behavioral biases in the human psyche - look it up). Holding onto a scarce resource that everybody wants is a big deal because it enables a rise in status and power. Evolutionary psychologist David Buss explains these human traits, better that I can do here, in his highly acclaimed textbook. What I'm saying is that human nature is intimately linked to survival needs and any resource that facilitates survival is liable to be fought for. We gotta make peace with this and find safe ways for each of us to have access to what we need. But instead of protesting we should think about solutions. Even your fleece is made out of oil. Not to mention the case of your electronic device on which you're reading this. Oil is everywhere and it penetrated our society so well that we are now faced with high inconvenience costs to switching. But we gotta do it eventually. Not because we're superior beings and think about the planet... (I wish it were so). Most likely we'll be forced out of oil. And let me riff on this a little more since we're at it. Why so many people on this globe? Do you know which are the biggest factors that contributed to the rise of human population on Earth? You see, our numbers were kept in check by the forces of nature: hunger, diseases, being eaten by predators, natural disasters, wars (even killing among ourselves is a force of nature). But the discovery of oil (stored energy) and antibiotics (and modern medicine further on) created amazing comfort for us. We basically managed to trick nature! We bypassed natural selection through vaccination and thus even the weak were able to live and multiply. The surplus of energy which had been buried underground for millions of years (oil) sparked what we now call the modern society. Coz the extra energy fueled everything else: research, modern medicine, better and faster transportation, and... not to be missed, entertainment! With extra energy comes leisure. I don't blame you if you call me cynical. Maybe I am. However, I'm just a big fan of philosophy, anthropology and psychology. And one of the principles of philosophy is too view the world as it is, not like you want it to be. And now that I've loaded you with tons of guilt about using petrol, let's burn some more. :) See? I can also be funny, not just cynical. But you still need power, don't you? You have a cabin up in the mountains and you wanna spend two weeks with your family there but there is no power. Of course, you could have equipped the cabin with solar panels, inverters, batteries and what not - you know - living off the grid and such. But you only go up there once a year or less so it makes no sense for you to invest too much, especially since there are no permanent residents to guard against thieves. 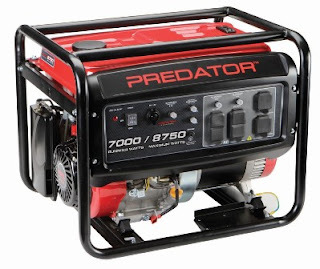 So you naturally carry an electric generator to power your cabin. It's much more convenient and because it's portable you can also power your electric tools and gadgets without being linked to your cabin. You can even go camping and enjoy the comfort that electricity gives you. That's why you may wanna check GeneratorAid.com - a website dedicated to helping you choose, compare and contrast different portable electric generators. Everything from tech specs, power, best prices and buying guides can be found on their resource site - specifically built for the conscious consumer who's looking to make an informed decision when buying a generator. While we're all here and have to live burning oil, still, this doesn't mean we can't do our part in easing the planet of the bad consequences of the comfort lifestyle which we take for granted. Encourage research in green alternatives. Hey, maybe your kid is the next genius who's gonna solve this so why not expose him/her to science by making it fun. Neil deGrasee Tyson is doing a great job with astrophysics, why not have a media celebrity on green energy? Promoting knowledge and science can be your contribution. Walk or cycle when driving is not necessary. You know the benefits for physical activity already but we can add to that the fact that the city will be polluted less. Also less car traffic means a better experience for everyone who's commuting. P.S. - You may wanna choose your electric generator based on low noise as well. You don't wanna freak out the wildlife while spending time at your cabin.